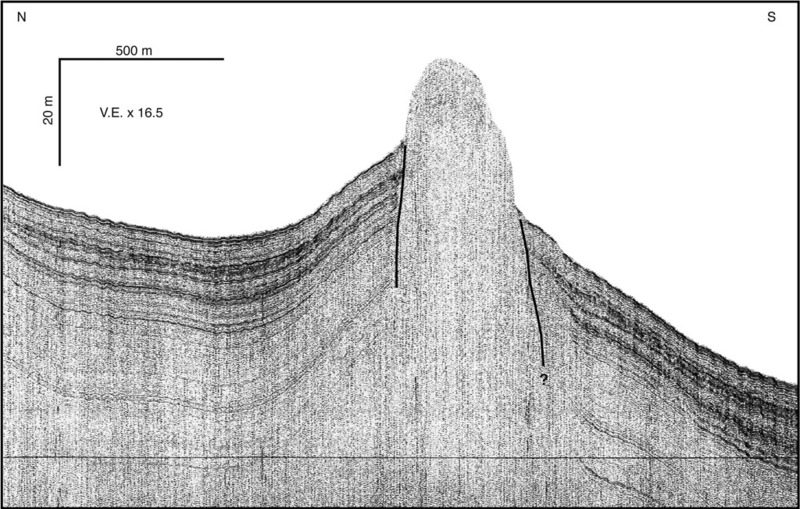 The diapir piercement structure shown in the above figure is a mud volcano at 800 m water depth that lies 25 km offshore from Redondo Beach, CA. The mud volcano is formed by gas venting through the upper sediment fill near the southeast end of Santa Monica Basin. The sediment is deformed as it is pushed up (note the lack of internal structure in the diapir compared to the sediment on its flanks); this feature formed at the basin margin above the San Pedro Basin fault zone, which is the presumed source for the venting gas. (click image to view a larger version). A joint study by the Geological Survey of Canada and U.S. Geological Survey of the submarine turbidite systems formed in the Santa Monica Basin of the California continental borderland provides limited observation of previously mapped fault systems generally associated with the basin margins. This report evaluates the use of high-resolution seismic-reflection data, primarily from a deep-towed boomer system, to determine the character of deformation and to evaluate the timing of the most recent activity. The ages of key reflectors that have been mapped across much of the basin floor are established through correlation with dated cores from Ocean Drilling Program Site 1015. In general, the deep-tow boomer records show that deformation within the last 20 ky is common: (1) along traces of the San Pedro Basin fault zone within the northeast margin of the basin and (2) in the western corner of the Santa Monica Basin near the intersection of northwest-trending faults interpreted to experience oblique slip with east-west-trending structures associated with compression within the Transverse Ranges. Locally, fault displacement in these two areas offsets the sea floor or reaches within a few meters of the sea floor. Deeper penetration seismic-reflection profiles obtained during the same study indicate deformation elsewhere along basin-margin faults during the last 70 ky.